Like dogs and cats living together. This month’s merger of Pet Valu and Pet Supermarket under the Roark Capital Group umbrella creates North America’s third largest pet specialty retailer. Operating as Pet Retail Brands yet retaining their unique banners and brands, Pet Valu and Pet Supermarket will be led by a single President and CEO, Pet Valu’s Tom McNeely. Put Valu, headquartered in the greater Toronto area, brings 770 stores to the partnership, approximately 210 of which are located in the US, while Sunrise, Florida-based Pet Supermarket chips in 165 locations. The combined 370+ US stores places Pet Retail Brands in a dead heat for the #3 ranking (total US stores) with expansion-minded Pet Supplies ‘Plus’ and its 360+ stores. Pet Supplies ‘Plus’ nearly equaled its 2015 total for deals signed in the first half of 2016 and has embarked on an aggressive plan to enter the California market. 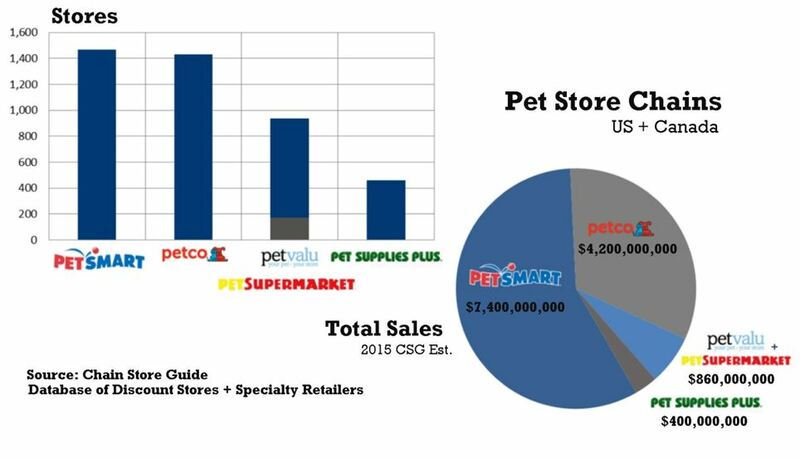 At the same time the big two, PetSmart and Petco, will add stores at a rate of approximately 5% per year in the near term according to Chain Store Guide projections. Given the current competitive environment, Roark’s move is sound. The newly formed Pet Retail Brands provides a more substantial base from which to launch its own growth strategy, assuming the two constituent companies can quickly overcome any challenges to leveraging shared best practices and economies of scale.